Supported by National Natural Science Foundation of China (81170092). Abstract: Objective To explore the effect of PRKAG2 gene G100S mutation in cystathionine β-synthase (CBS) region on adenosine monophosphate-activated protein kinase (AMPK) activity in cardiomyocytes of mice. Methods A human PRKAG2 (G100S) transgenic mouse model was established. 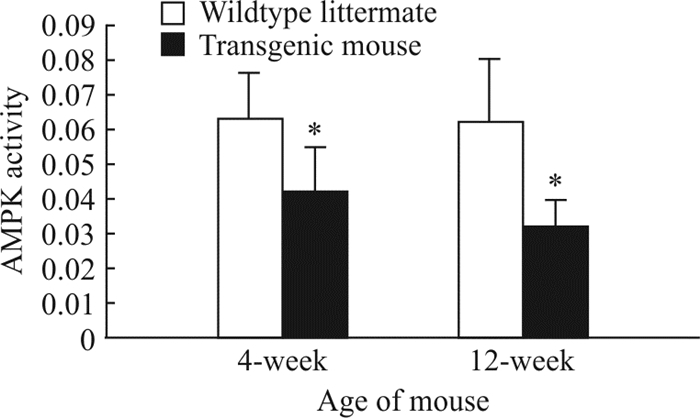 Four-week-old and 12-week-old transgenic mice, and 4-week-old and 12-weekold wildtype littermate were randomly selected from N4 generation mice (n=6). The activity of AMPK in mouse cardiomyocytes was detected by phosphorylation assay kit. The difference of AMPK activity was compared between transgenic mice and wildtype littermate, and the changes of the activity of AMPK with the increase of age were observed in transgenic mice. Results The AMPK activities in cardiomyocytes of 4-week-old and 12-week-old transgenic mice were significantly lower than those of the wildtype littermate (0.042±0.013 vs 0.063±0.013, and 0.032±0.008 vs 0.062±0.018), and the differences were significant (P=0.019, P=0.004). There was no significant difference in the AMPK activity of cardiomyocytes between 4-week-old and 12-weekold transgenic mice (P=0.135). Conclusion The PRKAG2 gene G100S mutation can cause a reduction of AMPK activity in cardiomyocytes of transgenic mice, and AMPK activity does not significantly increase or decrease with the growth of the transgenic mice. THEVENON J, LAURENT G, ADER F, LAFORÊT P, KLUG D, DUVA PENTIAH A, et al. High prevalence of arrhythmic and myocardial complications in patients with cardiac glycogenosis due to PRKAG2 mutations[J]. Europace, 2017, 19: 651-659. 陈挺, 刘杰, 肖良, 鲍礼智, 余云华, 郑兴. 心脏过表达人源PRKAG2(G100S)转基因小鼠模型的建立[J]. 第二军医大学学报, 2016, 37: 273-278. CHEN T, LIU J, XIAO L, BAO L Z, YU Y H, ZHENG X. Establishment of transgenic mouse model with cardiac overexpression of PRKAG2-G100S[J]. Acad J Sec Mil Med Univ, 2016, 37: 273-278. DYCK J R, LOPASCHUK G D. AMPK alterations in cardiac physiology and pathology:enemy or ally?[J]. J Physiol, 2006, 574(Pt 1): 95-112. CHEUNG P C, SALT I P, DAVIES S P, HARDIE D G, CARLING D. Characterization of AMP-activated protein kinase gamma-subunit isoforms and their role in AMP binding[J]. Biochem J, 2000, 346(Pt 3): 659-669.